Ryobi Score wireless speakers operate using SKAA® technology, meaning no WiFi is necessary. The new technology has great range, low power consumption, and offers great flexibility and super-fast pairing. Using the SKAA® technology, one Ryobi Score primary speaker can exert its awesome power over up to four more secondary speakers. Each network must have at least one primary speaker (P760) to do the transmitting; additional speakers in the network can be either a secondary speaker (P761) or another primary speaker. Secondary speakers have individual controls, but require a primary speaker to operate. 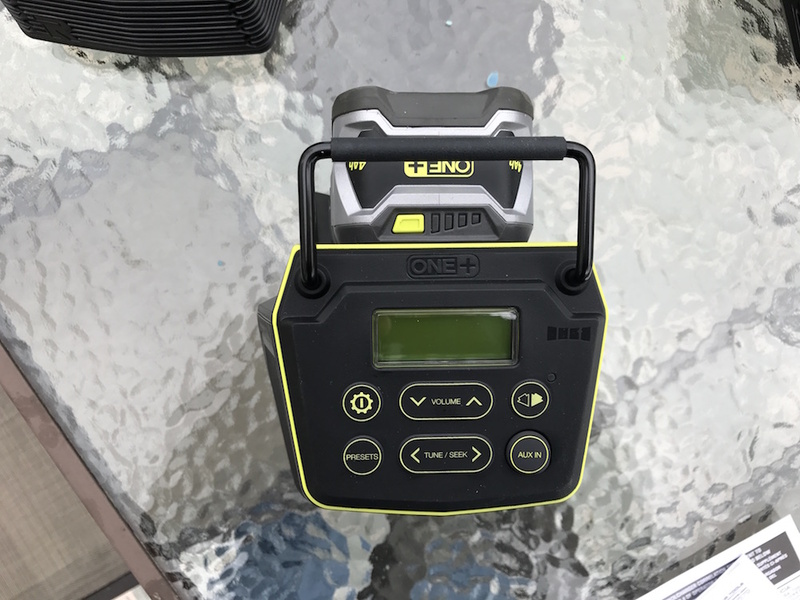 The Ryobi Score Wireless Speakers are plastic, but seem pretty robust. The four little rubber feet do an excellent job keeping the speakers from dancing around. The built-in handles work great for carrying the speakers around, and double as a hanging attachment. It’s also designed to be a little spot to park your phone or MP3 player, although my iPhone 7 plus is just a tad too wide to fit with its protective case in place. Getting the Ryobi Score wireless speakers set up and synched with my iPhone was a breeze. We received four speakers to evaluate, one primary speaker and three secondary speakers. I slid them out of the box, and slapped a battery into each one, and they were ready to rock. 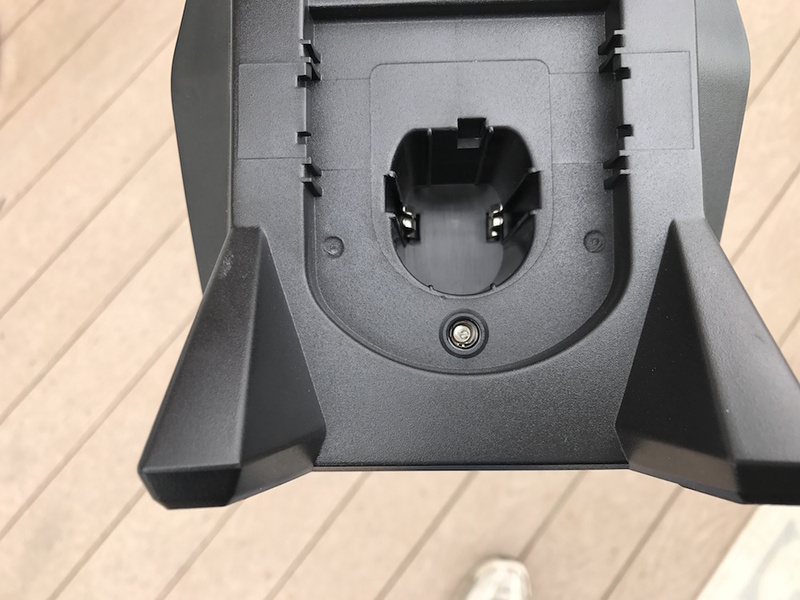 If you don’t have a battery, or you’ll be setting a speaker up close to an outlet, just plug in the included adapter, using the connector in the battery compartment. Unbox them, slap some batteries in, and you’re ready to get in synch! Plug in the included AC adapter, and the music never has to stop. The pairing process was fast and simple enough that even someone with a low tech IQ (me) couldn’t screw it up. I turned on the primary speaker, and a little LCD “bt” began flashing slowly. 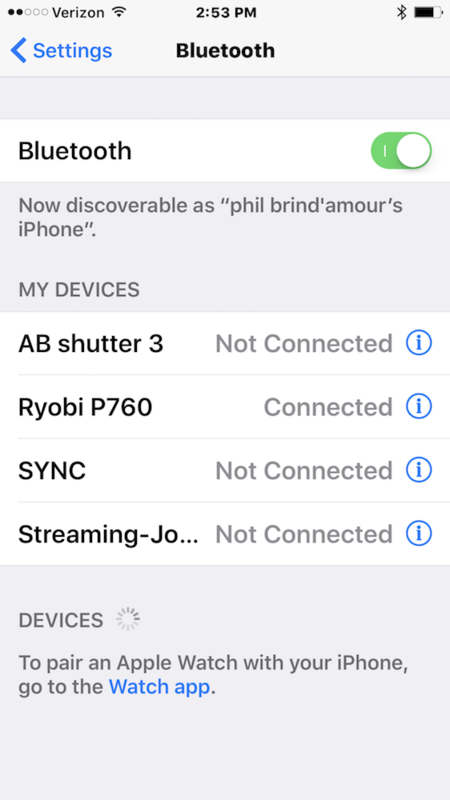 I went to the settings on my phone, turned Bluetooth on, and Ryobi P760 appeared in the device list. I selected it, and a couple of seconds later, the little bt stopped flashing on the speaker. All paired! The flashing “bt” turns solid when pairing is compete. Select “Ryobi P760” from the list, and start crankin’ the tunes! In addition to being able to stream music from your mobile device, the primary speaker also includes a built-in FM tuner and an AUX-IN port. And here’s a HomeFixated timesaving tip: If you have an auxiliary device to connect, don’t spend a lot of time searching all over the primary speaker for the aux input jack. 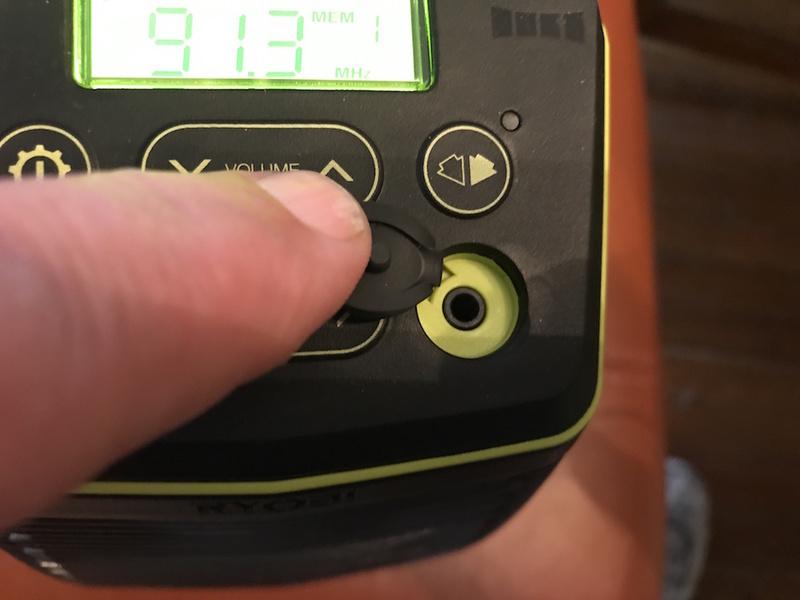 The little “AUX IN” button is actually not a button at all, but a little pop-up cover for the jack. I think it was intentionally designed to make slow learners, such as myself, feel frustrated and inadequate. Where the $#@! is the Aux In port?! The wireless aspect of the speakers is a key feature, and I was curious to see how the Ryobis would do. I’ve had less than stellar results from some previous Bluetooth devices, some of which are only good when they have a clear line of sight. 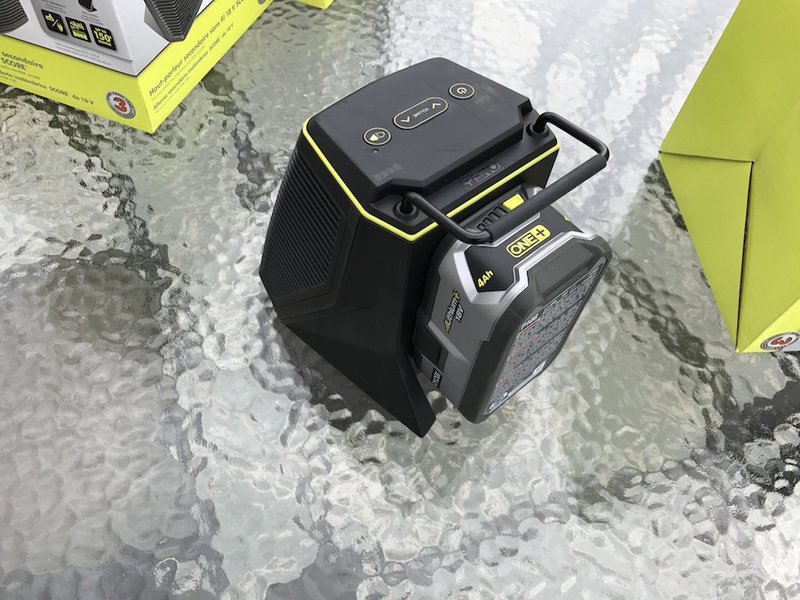 Ryobi claims Bluetooth range on the Ryobi Score Wireless Speakers is up to 150’, even through walls and floors. We have a large old house, with 10’ ceilings, and lots of plaster with wood and metal lath, so it would provide a good challenge. 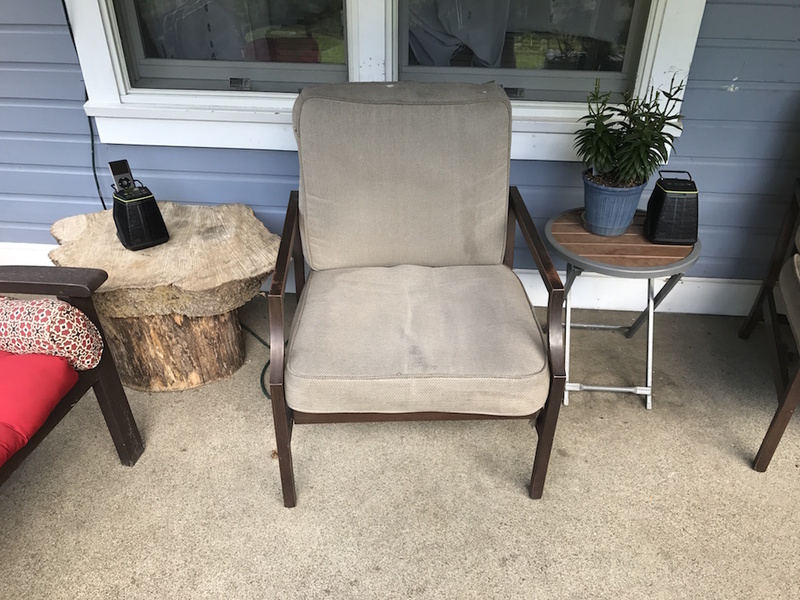 I first set up the primary speaker on the back porch. The secondary speakers worked fine outdoors, and in the entire first floor. They worked in parts of the upstairs, but dropped off in the front rooms. To be fair, the signal would have to go through an exterior wall, three interior walls, and a double-thickness floor to get in there, so overall I think the system did pretty well. 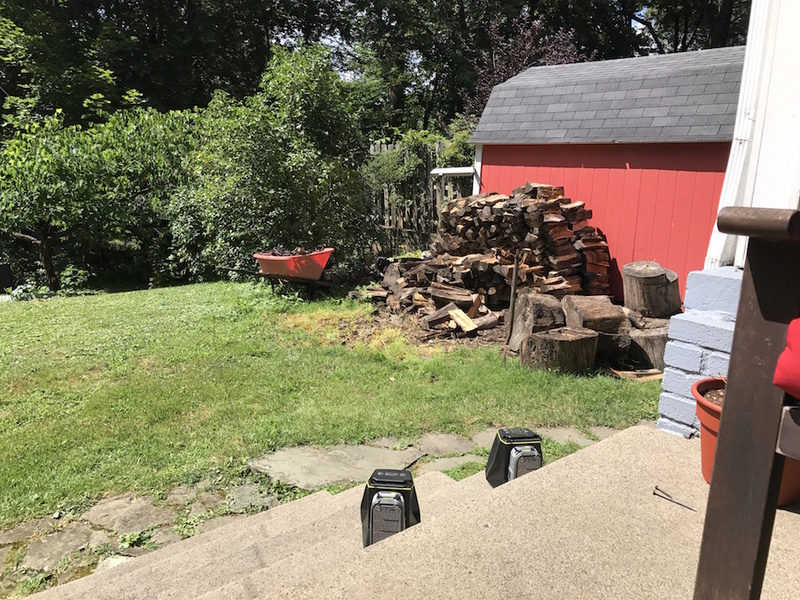 When I moved the primary into the rear room of the first floor, the secondary speakers worked fine outside all the way to our fire pit and beyond, and in all the upstairs rooms. From the back porch, the signal reached most of the rooms inside. 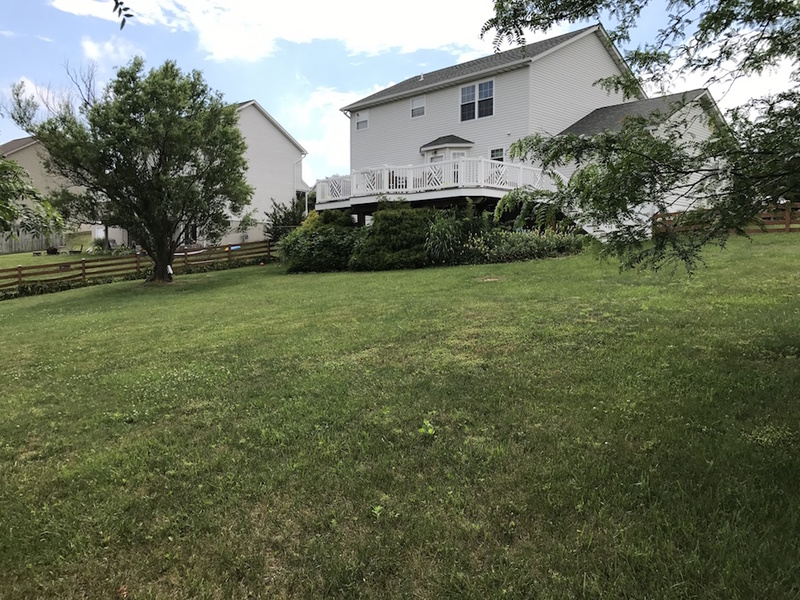 One of my daughters and her husband have a nice deck out back, and a large yard. I spaced out all four speakers across the 34’ wide deck, and fired ‘em up. 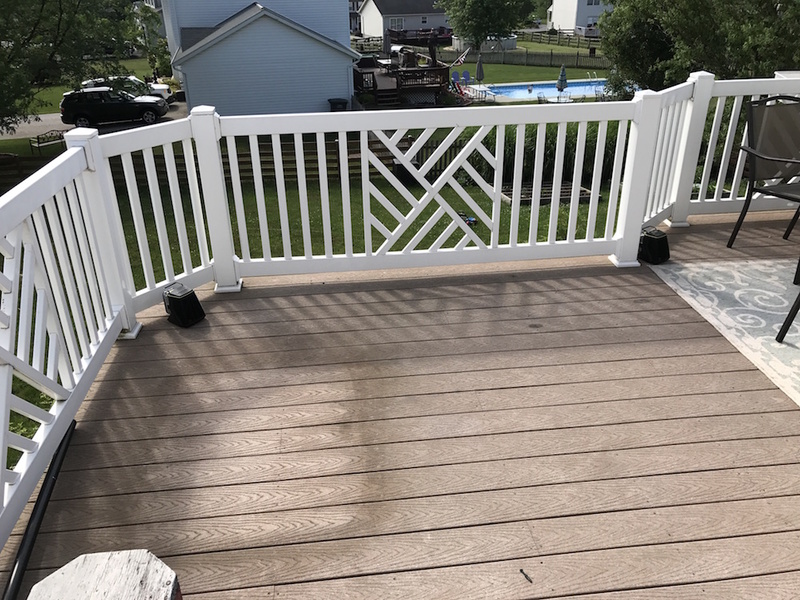 They sounded great, and did an excellent job of blanketing the entire deck with pretty even sound, allowing everyone on the porch to hear without prompting the neighbors to call the police. 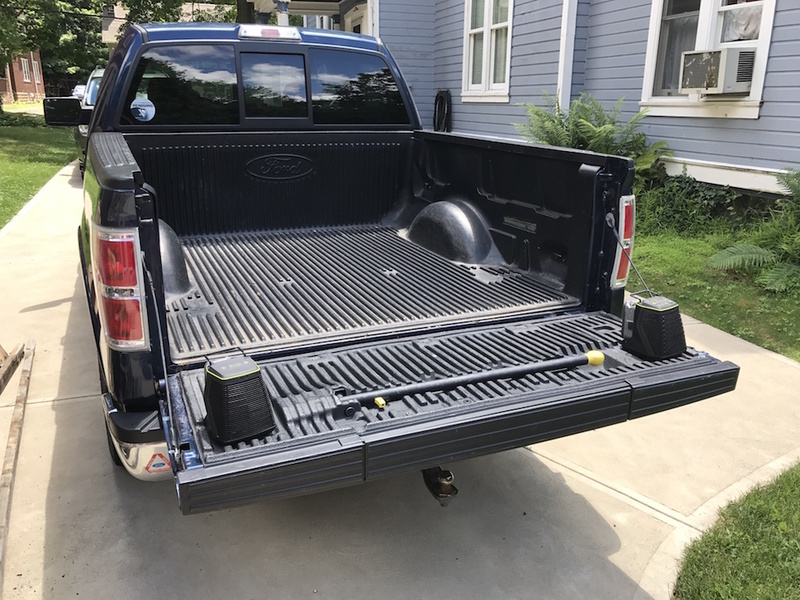 Four speakers spaced along the deck provided great coverage. I took one of the secondary speakers out to the farthest corner of the yard, roughly 120’ away. The Bluetooth signal had no trouble, and the sound was still just as good. That would be a pretty sweet setup – she could sit on the deck, eating bon-bons and sipping wine, while enjoying the tunes, and he could take a speaker down to the raised garden bed and crank it up while getting the weeds yanked. Or vice-versa – opinions may vary. Anyhow, they were impressed, and even graciously offered to hang onto the speakers to provide extensive long-term testing! To infinity and beyond…the Ryobi Score wireless speakers worked fine at a distance. One thing to note: I had originally paired the primary speaker with my phone. When my daughter tried to pair her iPod, she couldn’t do it until I had actually turned the Bluetooth off on my phone, even though I wasn’t streaming at the time. The same thing happened when my second daughter tried pairing her phone; both my phone and my other daughter’s iPod had to have the Bluetooth off first. Not a big deal, but something to be aware of if you’re having trouble pairing a device. Crank It Up To 20! The sound quality from the Ryobi Score Wireless Speakers is surprisingly good for such small speakers. 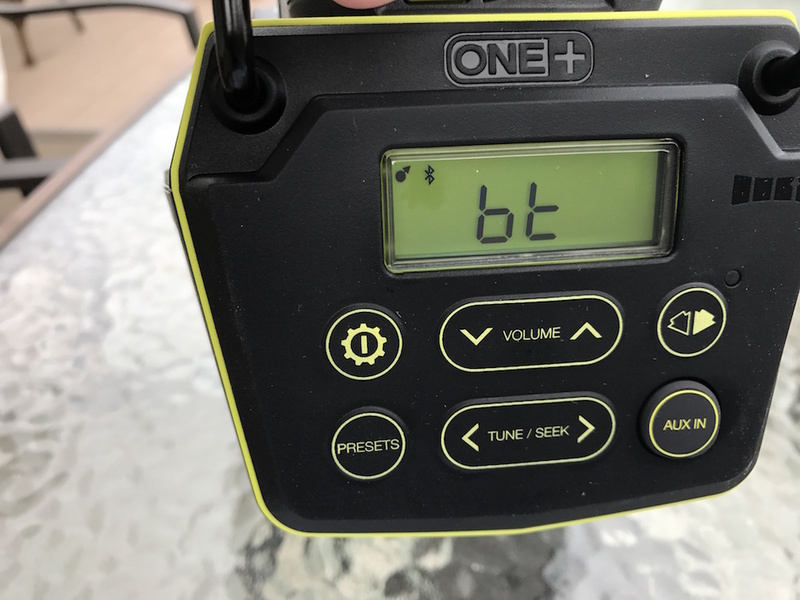 Depending on your preferred musical genre, you can crank those suckers all the way to 20, with minimal distortion. This feature will be especially useful when my significant other is not on the premises. The music comes out crisp and clear, and the bass sounds way better than you’d expect. One feature I really liked is that once the speakers are linked, changing the volume using your phone or MP3 player changes the volume on all connected speakers. It’s also great to be able to individually control the volume on each speaker. That way, if the group around the fire pit is mellower than the group doing keg stands in the driveway, they can lower the volume to enable conversation without shouting. Another handy feature is the ability to control your mobile device or other music source right from the primary speaker. You can use the “seek” and tuning buttons to change tracks, or pause the music with the “preset” button. You can also mute and un-mute any speaker easily. 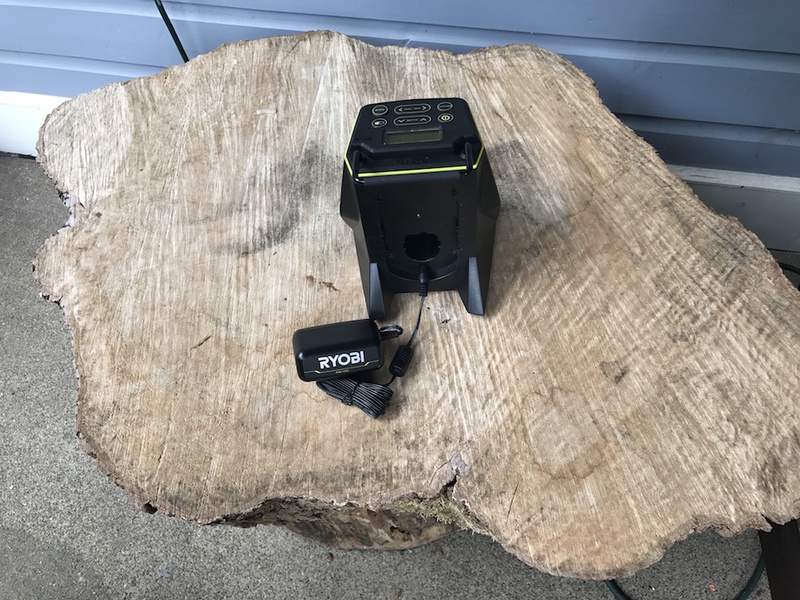 Run time for the Ryobi Score wireless speakers is incredible. 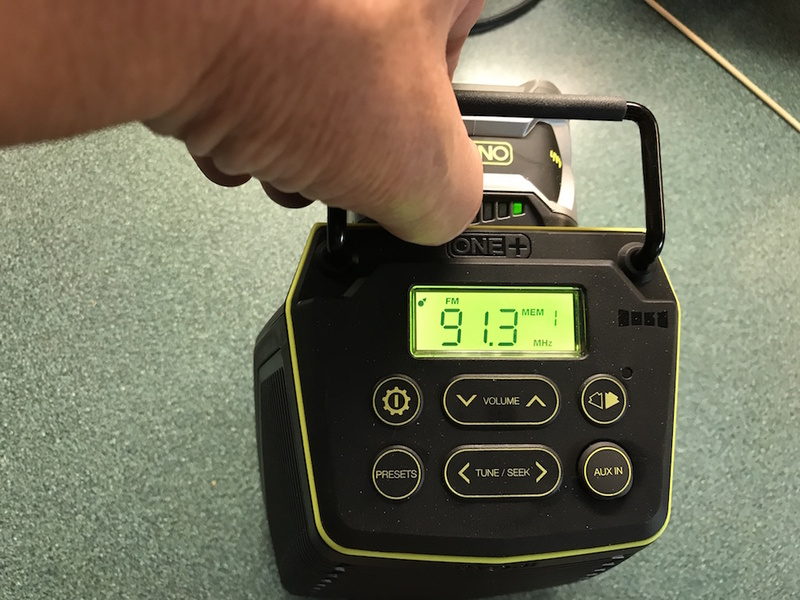 I had Ryobi’s 4.0 Ah One+ P108 Li-Ion batteries installed. I started with a fresh charge at my daughter’s, and we listened for several hours. When we got home, I ran the speakers for several more hours, working in the yard. The charge indicator on the batteries still showed 3 out of 4 bars! Hours later, somewhat better, and the music still going strong! 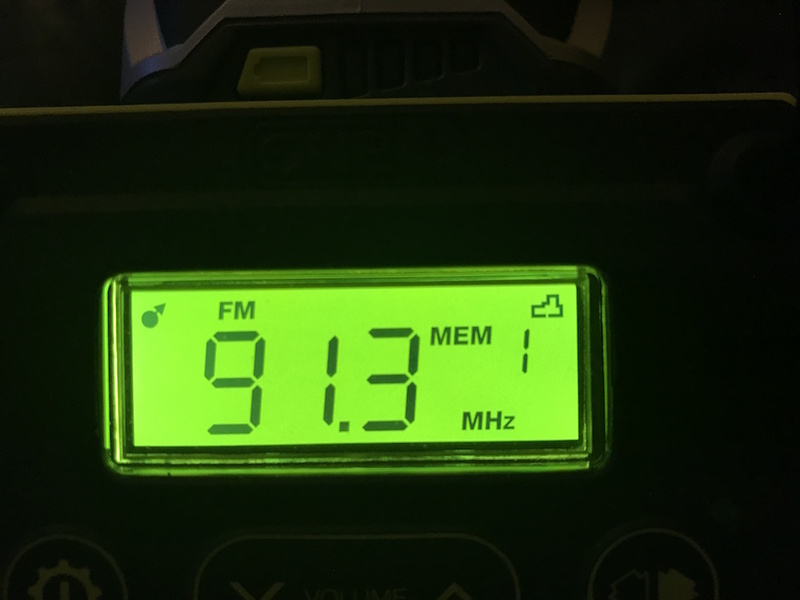 I topped off the batteries, and turned on the primary and one secondary speaker, using the built-in FM tuner. I turned them on at 4:00 p.m., and left them going all night. At 11:00 the next morning, they still showed 2 bars of juice left. I left to do some work, and when I got back at 5, beautiful music still filled the air. The primary speaker was still crankin’ the tunes, even with only one bar left. It was STILL playing when I went to bed around 11:30, and it expired peacefully sometime between then and 7 a.m. the next day. That means the Ryobi Score wireless speakers played continuously for over 31-½ hours! I had it at a fairly low volume, to preserve marital harmony, but that’s still a pretty amazing stretch for one battery. And the battery on the secondary speaker still had two bars of juice left in the morning! After over 31 hours, the “Low batt” icon appeared. Sometime after that it finally quit. 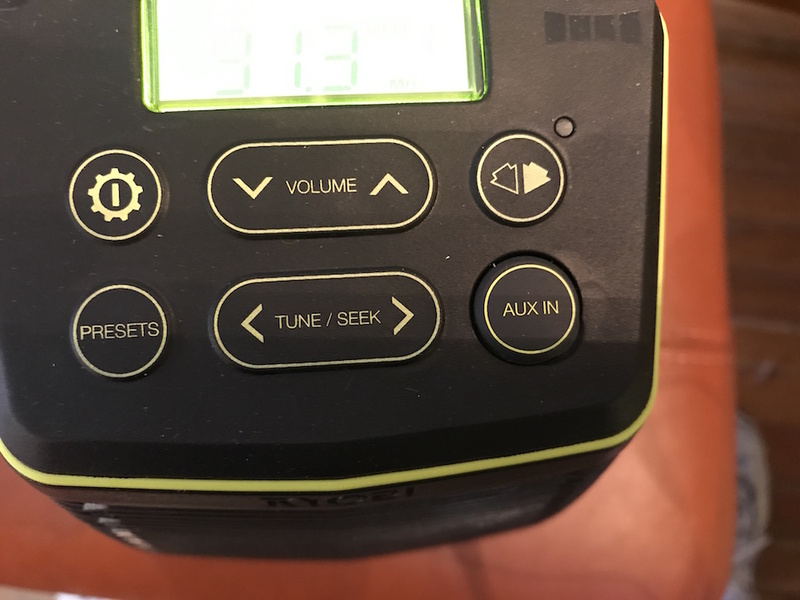 I was prepared to be unimpressed with the Ryobi Score wireless speakers. I figured anything that small can’t sound very good, and I was pretty skeptical about the extended range claims. For the first time in my admittedly feeble memory, I was wrong – Ryobi hit just the right note. 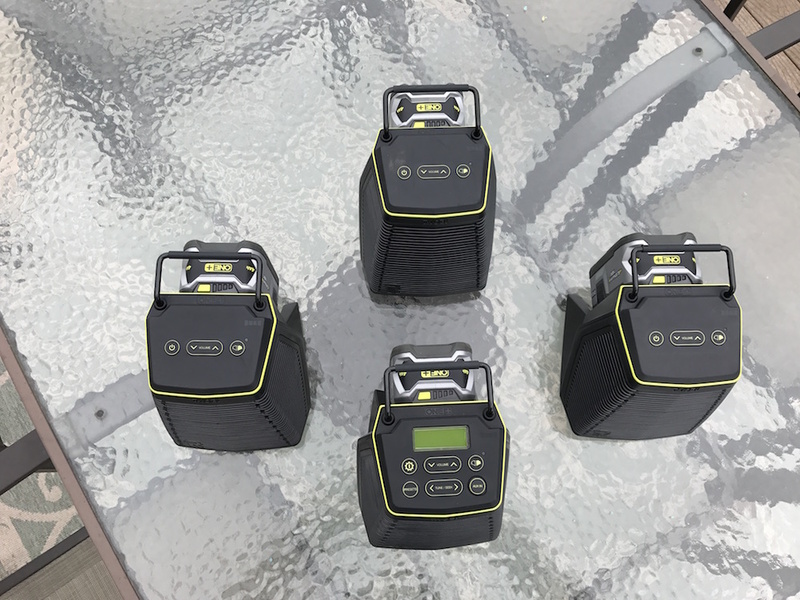 They sound great, they’re fast and easy to set up, they have very good range, and they can wring an incredible amount of music out of a single 18V battery. The ability to plug into an AC outlet when available is icing on the musical cake. 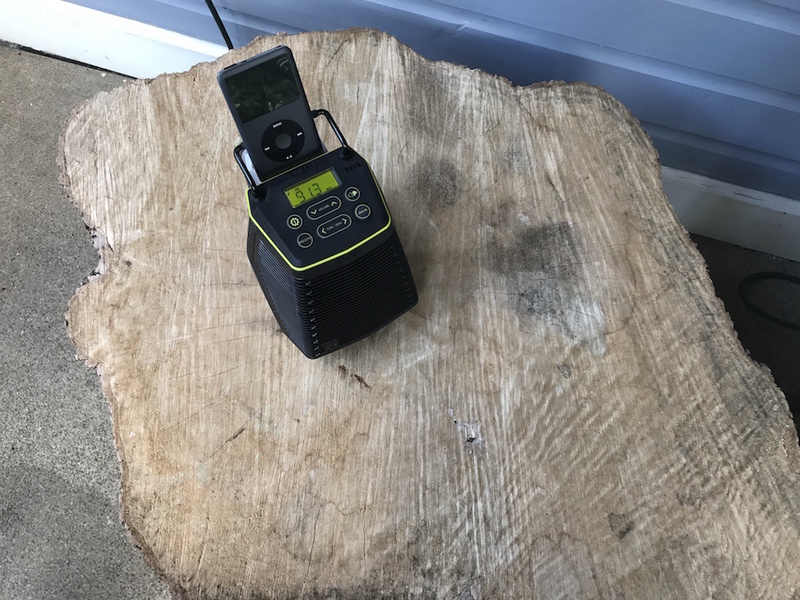 I think the Ryobi Score wireless speakers would be a welcome addition to any job site. Their size lets you stick them wherever you want – and I mean that in a positive, friendly way. The handles provide options to hang them from a 16p. nail, or dangle them from a twisted piece of Romex. I can’t wait to get them set up in my soon-to-be-built shop, and they’ll be easy to relocate to the deck for those all day, all night family get-togethers. Any drawbacks? Not really. Some might complain that they’re a tad pricey, at a C-note each. If you just look at these smallish speakers, that does seem a bit steep. Ryobi obviously used quality components in the Score speakers, though, and if you give them a listen, you’ll be much more inclined to lay your money down. And if you can wait, the Home Depot periodically runs some sweet promotions on Ryobi products. The Ryobi Score wireless speakers are backed by a 90-day exchange policy and a three-year limited warranty. You can check them out and score a speaker or two – or five – at the Home Depot. These speakers do work well and sound great. Nice system, if a little bit pricey. Agreed. 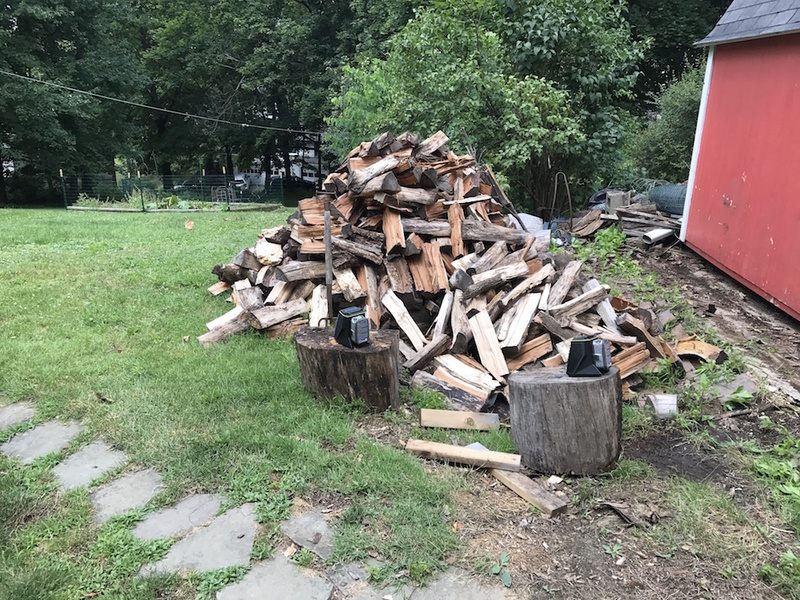 I’ve been giving them a workout, and really enjoying using them at our farm. Been doing a lot of demo in the barn, and no good radio stations in the area, so I’ve been streaming music through my phone. Makes things MUCH more tolerable having good tunes! Cool system and thanks for this very through awesome review! Thanks, Scott – it IS a cool system, and this is the kind of testing I don’t mind doing at all!